It is extraordinary enough that the prime minister has been interviewed for a second time by police in the cash-for-honours investigation. It is just as extraordinary that the 45-minute conversation was kept secret for the best part of a week - particularly as there have been persistent claims that someone is leaking details of this probe. Those two bare facts have already led to any amount of speculation over exactly what they indicate. Have the police now moved onto what is, in effect, a separate inquiry into a Watergate-style cover-up, as some are now claiming? Does it all mean the inquiries, once believed to have been near completion, are now weeks away from a conclusion? And has it increased or diminished the likelihood that charges will eventually be laid against individuals and, if so, at what level in the Labour Party or even the government? There are attempts, specifically by the Welsh and Scottish Nationalists, to seek answers from the sequence of events over the past couple of weeks, which have also seen Mr Blair's closest aides Ruth Turner and Lord Levy arrested and interviewed over suspicions of perverting or conspiring to pervert the course of justice. 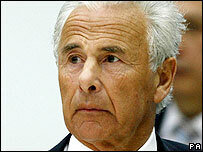 Did Mr Blair's interview, for example, have any bearing on the second arrest of Lord Levy a few days later? And finally, there is genuine bemusement over why the police required confidentiality on "operational grounds" and why Downing Street agreed to it, given that it was bound to lead to charges that No 10 spokesmen had misled the public. Mr Blair's official spokesman has said he was unaware of the second interview until Wednesday evening and that the fact it was taking place was kept to a "very tight" group of individuals. That seeks to inoculate him from claims he deliberately misled journalist, but points back to the question of why the news blackout was deemed necessary in the first place. Whatever this all amounts to - and it must be stressed that charges have not be laid and may never be laid - it is having a profound effect on the prime minister's last days in power. He was already facing pressure from many on his own backbenches to at the very least announce a timetable for his resignation. And only yesterday, Tory leader David Cameron demanded Mr Blair's resignation, claiming his determination to cling on to power was even against the national interest. Mr Blair is thought to want to remain in power to take the expected body blow from the Scottish, Welsh and English local elections in May. But, as one Blair loyalist put it to me, the prime minister will find it hugely difficult to hang on long after that date. On the other hand, Mr Blair's allies insist it would be absurd for him to go now as it would appear to be an admission of some guilt. And they point out that no charges have been laid and that Mr Blair has only been interviewed as a witness. 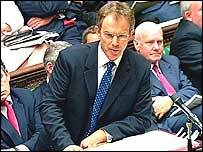 There is undoubtedly an element of unfairness on the demands for Mr Blair to bring this all to a close by resigning now because, despite all the speculation, there are precious few facts available. But the prime minister is currently suffering from one of the worst nightmares that can engulf a prime minister - he has become the victim of events entirely out of his control.